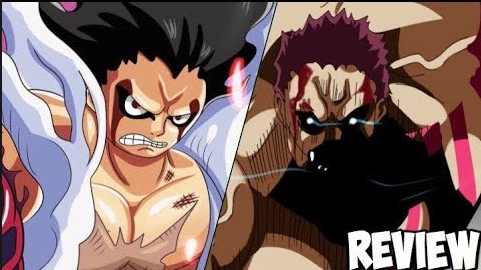 The last few episodes have set the table for the final stretch of Luffy and Katakuri's battle on One Piece, and the Whole Cake Island is about to come to a grand close with the debut of a brand new Gear Fourth form.Though Luffy's newest Gear Fourth version won't be fully revealed until the next episode, the latest episode ends by making an appropriately huge introduction for Gear Fourth Snake man. Luffy made his way back to the Mirro-World for the second phase of the fight with Katakuri, he has been fighting to land any decisive blows that changed in the latest episode, however, as the two of them are beginning to wear themselves down thanks to the drawn out nature of this brawl. Luffy seemed to get the closest he ever has to mastering the Observation Haki, and he's beginning to find gaps in Katakuri's defense. But their final stand against one another cemented that this truly is the final stand in the fight overall. Luffy decides to unleash one more Gear Fourth form, something fans have never seen. This transformation reveals a more slender version of Gear Fourth, with much wilder hair. It's also accompanied by a pillar of smoke that curl and twist to look like snakes.